531 backers pledged $30,025 to help bring this project to life. Kitchener is Oakland, California's little kitchen that could. As Oakland's first incubator kitchen, we opened in the Summer of 2012 as a place where start-up food business could cook legally for the public. But we're more than just a commercial kitchen, we're also a community and leaders in the artisan food movement in Oakland. We came on the scene and created quite a stir with our mission: we help burgeoning and talented food makers grow and thrive through a strong kitchen culture that's embracing, accepting, knowledgable, and brimming with insatiable entrepreneurial spirit. That's us, Kitchener Oakland. Like a movie theater which offers unique movie experiences at different hours, the Kitchener Snack Bar will offer unique food experiences at all hours of the day and evening. It's a shared take-out window storefront that will rotate different artisan food makers throughout the day, a place where a community of start-up artisan food makers who can't afford their own storefronts can call their shared brick-and-mortar. The Kitchener Snack Bar will give the artisans the opportunity to list store hours on their website and Yelp pages so that customers can find them regularly. It'll also give them exposure they wouldn't have otherwise received by operating a brick-and-mortar with dramatically minimized financial risk. Let's say Huzzah to that! We'll even offer regular pay-what-you-can meals so that people from all economic situations can have access to fresh and delicious food, no matter what their financial situation. At Kitchener, we believe that access to fresh food is a human right, and it's a right we'd like defend, encourage, and enable. And when our take-out windows are open, you'll find us open on First Fridays - the monthly street party in Oakland where all of Oakland comes out to party and celebrate Oakland's vibe and culture! After all, we're just a stone's throw from the celebration's ground zero. 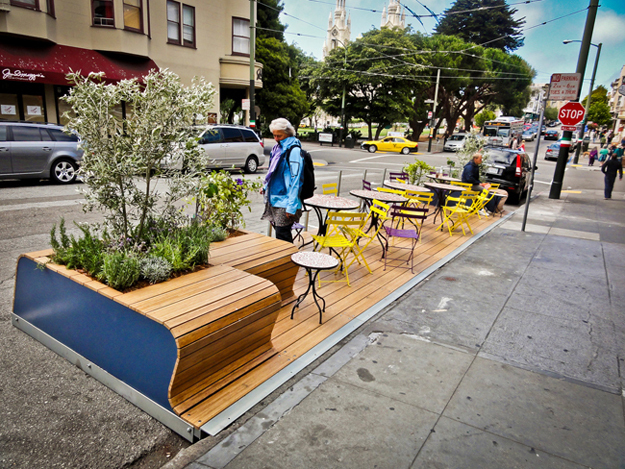 And for people who love parklets - beautiful outdoor eating areas that sit on former parking spaces - we're petitioning for a parklet so that eaters can enjoy the take-out window food right outside the kitchen. And when the parklet happens, we'll serve beer and wine on the parklet and Kitchener will become a fresh face in al fresco wining and dining. Help us make the Kitchener Snack Bar into a reality! We'd love to feed people all hours of the day and night, whenever a hunger hankering hits. Oakland food scene is on an upswing, and we'd love to contribute to the energy and momentum that's making our city a safer, happier, and (even) more delicious place. Thank you for supporting the smallest of small foodmakers and for supporting the "Take-Out Windows of Opportunity." With your help, you'll be giving group of talented artisans who can't afford their own storefronts a chance to grow their businesses via a unique restaurant concept and feed a city of people - of all demographics - small-batch artisan food made with Oakland flavor and soul. All our rewards will be provided by the Kitchener artisan food makers themselves, so whatever you can give you'll receive in repayment from our community of artisan food makers! Kitchener Snack Bar - Here we come! We realize there are potential risks to this project, so we've come up with several back up plans as we'd like to see this mission through to completion within the first half of 2014. We have the help of the City of Oakland, the Alameda County Health Department, a seasoned architect, and of our fervent supporters so we're very confident the Kitchener Snack Bar will come to fruition. - The architectural plans for the Kitchener Snack Bar Project (floor plan and elevations) have already been drawn up and are currently being reviewed by the health department. The green light looks imminent, and once that happens, the City of Oakland reviews then approves the plans for building. If the plans do not get approved, a revision of the plans should solve the issue. - The artisans at Kitchener are onboard and are gung-ho about the project! We've also reached out to other food makers in Oakland who do not have a brick-and-mortars who we'd like to collaborate with as well so there are always delicious food options being offered at the Kitchener Snack Bar. In Oakland, the general sentiment between food makers is that we all want to see each other succeed, and to share resources is the least we can do to help each other survive. - In the event that the project goes over budget, we'll make another grassroots push to raise money via crowdfunding and fundraisers to make the Kitchener Snack Bar happen. The windows HAVE to happen for the good of the small food artisans in Oakland. And we can't wait to share them with you once they're built and open for business! You're our hero! You'll receive our eternal gratitude and love from the Kitchener family. It's a snack! You'll get one piping hot Argentine empanada from Javi's Cooking at the Kitchener Snack Bar! Show off your Oakland pride! You'll receive a lovely limited edition "I Love Oakland" print designed and made by Christina Mitchell of East Bay Dish. This is good for one meal ($10 value) at the Kitchener Snack Bar! This is good for 2.5 meals (a $25 value) at the Kitchener Snack Bar! Yum! You'll get 3 whole meals (a $30 value) at the Kitchener Snack Bar! Yum! You'll get 5.5 meals (a $55 value) at the Kitchener Snack Bar! Feed yourself for days! You'll get 6 whole meals (a $60 value) at the Kitchener Snack Bar! Feed yourself for days! You'll get 11.5 meals (a $115 value) at the Kitchener Snack Bar! This is our favorite deal! You'll receive 12 whole meals (a $120 value) at the Kitchener Snack Bar! This is our favorite deal! You'll receive 24 whole meals (a $240 value) at the Kitchener Snack Bar! FRESH STROOPIES FOR A PARTY: The Stroopie Gourmet will make/serve traditional caramel stroopwafels at a private event, within the Bay Area, for up to 50 servings. This is the philanthropist's donation. This reward will sponsor the food artisans for a MONTH of free window time at the snack bar, and you get to pick the month. You'll be giving the food artisans a huge advantage by providing free window time. You'll be publicly thanked on our social media pages as well as on the windows themselves during the month you sponsor!